Fr. Joseph Nohs has been serving the parish of St. Bernard since 2013. He was ordained a priest for the Diocese of Rockville Centre in 1993. He is known for his humor and his ability to connect with people on many levels and in many situations. Because he comes from a large family his homilies often reflect the struggles and the joys that large families can bring. He has been involved with the Knights of Columbus for many years and not only is he the chaplain for the Holy Innocence Council, but he is also a Forth Degree member since 2000. He is the moderator of the Rosary Society as well as the Columbiettes, Fr. 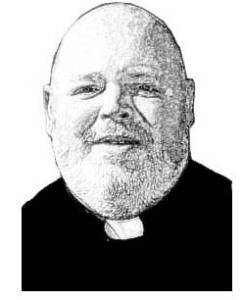 Joseph Nohs has been serving the parish of St. Bernard since 2013. He was ordained a priest for the diocese of Rockville Centre in 1993. He is known for his humor and his ability to connect with people on many levels and in many situations. Because he comes from a large family his homilies often reflect the struggles and the joys that large families can bring. He has been involved with the Knights of Columbus for many years and not only is he the chaplain for the Holy Innocence Council, but he is also a Forth Degree member since 2000. He is the moderator of the Rosary Society as well as the Columbiettes, the Family Life Ministry, the Catholics for Freedom For Religion.